Castlevania: Lords Of Shadow 2 begins with a beautiful lie. Dracula appears to be at the end of his unnatural life, a desiccated wreck of a creature, naked and painfully far from his own time. The supreme undead badass sits in the throne room of his city-sized castle, just as players always found him at the end of Konami’s NES games, when a bunch of noble soldiers burst in. He fends off a siege, bringing down a skyscraper-sized medieval robot made of wood and clockwork in the process. After that, the game flashes forward hundreds of years to the modern day. Dracula is a withered shell, and you take control of him as he stumbles into to the neon flood of modern city streets. Mercurysteam, the studio responsible for this incarnation of the nearly 30-year-old series, goes big from the start. Its spin on one of pop fiction’s most powerful figures appears to be a story about how ultimate power leaves you isolated and empty at the end of the world. It will be told through vivid graphic design and blunt, bloody video game fights. Then it all goes to hell, descending into hours of muddled, misguided, and inexplicably stubborn game design. 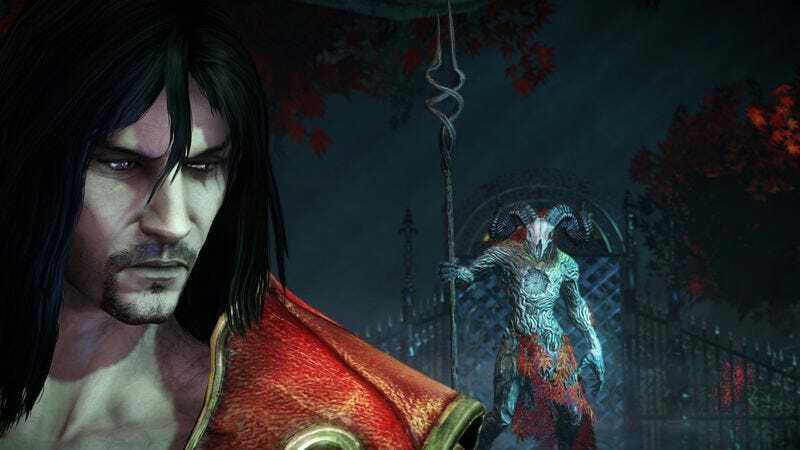 Satan, the prince of lies, is the villain of Lords Of Shadow 2, but he’d have to fib pretty hard to compete with the game’s opening bait-and-switch. Nothing seems awry at a glance. From the beginning, the fisticuffs are fun enough, and the skills you learn in that first fight are pretty much all you’ll use throughout the game. When monsters, knights, and skeletons surround you, you fend them off with one of three weapons. The Shadow Whip is your basic tool for slashing down foes. You can also bring out a sword, which can restore health with successful strikes on an enemy, and fiery claws that can erode and destroy shields. When he’s not hacking away, Dracula’s jumping up walls. For example, the aforementioned Dark Ages clockwork colossus has to be scaled, which means jumping from one conveniently highlighted spoke to the next without much skill or risk involved. (Sometimes you need to time a jump to avoid a shifting gear or electrocution.) Tired as these trappings may be, the game at least looks great. Once you find yourself in the future, however, Lords Of Shadow 2 loses the clarity of those opening moments. Zobek—previously a mentor to the vampire hunter who became Dracula after the conclusion of the first game—has survived into the modern age. He needs your help to defeat Satan and his children, the Acolytes, who have taken over the European city that was built from the foundations of Dracula’s old castle. They’ve set their sights on sullying the planet once and for all. (These are some old-school Miltonian machinations.) If Dracula can put the kibosh on Satan’s plans, Zobek will help end the vampire’s tortured existence. How do you put the kibosh on Satan’s plans? By turning into a rat and hiding in the shadows of a generic factory until you can clumsily possess a fat guy with a bazooka. No, seriously. Zobek and the game both insist that Dracula, lord of darkness, can’t fight the bald fat guys guarding Satan’s demon virus and weapons factories, so you’re forced to play hide and seek for long stretches of time. Sometimes your subterfuge includes turning into a rat at specially marked spots and then scampering through air vents. Other times, it’s taking control of a fat guy’s body so Dracula can get through a security door. This is Dracula, a guy who can turn into fog, fumbling with a security door. All the way until the end, even after you’ve seen a fully empowered Dracula bisect a demon lady the size of a blue whale, you still have to tiptoe around sometimes. Even more abrupt shifts come when Dracula’s search for the MacGuffins needed to pick his big fight with Satan are interrupted with trips to a dream version of his old castle. Sometimes, when you’re sent off to this brain castle, glimpses shine through of the lively that game Lords Of Shadow 2 could have been. Dracula’s dream world is haunted by his wife and son, and when Dracula speaks with his child or has to fight the specter of an old toy maker who lost his heart, an emotional game surfaces—a game about atonement and the corrupting influence of power. Lords Of Shadow 2 only speaks clearly one more time after its tantalizing start. At one point, Dracula has to fight himself, the Inner Dracula who has been plaguing the spirit version of the castle, to save his son. The implied conflict of Dracula’s inner turmoil, which has since been abandoned for stealth missions and some ill-defined fight with the devil, is made explicit as Dracula has to slash away at a bulbous mass of dead flesh with a snake-shaped core. By defeating it, Dracula literally gets wings, which let him jump in midair to reach new places. It’s a new tool to play with and a functioning metaphor for his redemption. But the game just leaves it there without exploring either the literal or metaphorical functions of the wings. Who can say what happened to create the rift between Lords Of Shadow 2’s opening and everything else that follows? At times, it feels as though there are two full games fighting for dominance. Sometimes it’s a schlock-fest, full of vampires running wild in the big city à la the Underworld or Blade movies. Other times, it’s a somber mixture of the Castlevania series’ weird aesthetic and Anne Rice-style gothic romance. Whatever Mercurysteam was trying to get at is lost in the mix, though. The game is as confused as its protagonist, and it’s hard not to wish that the studio could have conquered its inner conflict and found its wings.